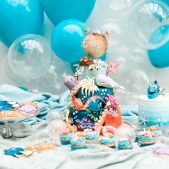 Underwater theme birthday parties can be such a delight, we’ve taken it one step further and turned it into a Disney classic with Finding Dory birthday inspiration. 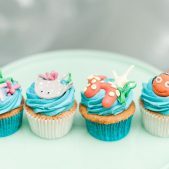 Who wouldn’t want a birthday party themed with everyone’s favourite forgetful fish? 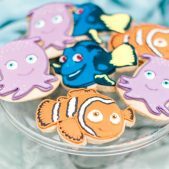 With her oh-so-cute laugh and adventurous spirit, Dory travels across the ocean to California’s prestigious Marine Life Institute in search of her parents. It’s a journey of courage and friendship. Dory is surrounded by friendly and helpful souls who help to reunite her with the glimpses in her memory and eventually her parents. 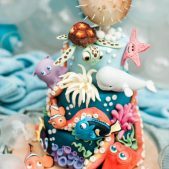 Dory’s colourful underwater world makes a truly spectacular theme for cakes and desserts. 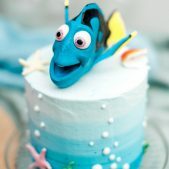 At Cakes by Robin we love making the most colourful and kooky creations, so when we heard about Dory we couldn’t wait to put the story into cake form. Who is your favourite character (apart from Dory of course)? We can bring Hank, the seven-legged octopus, or Bailey, the beluga whale, to life on your special birthday cake. With a theme to melt everyone’s hearts, our dessert tables will make your next birthday party a totally unforgettable one. Not only do they look good, they taste great too. It’s just what Dory would have wanted.